At Chinook we offer jet pumps for shallow well and deep well applications; they are ideal for the supply of water to rural homes, farms, and cabins. 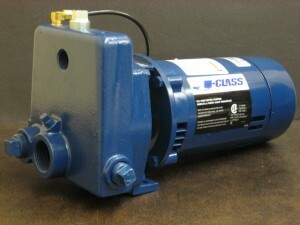 Jet Pumps can be adapted to run in a wide variety of bottom hole cavities and down-hole tools. The actual working components of the jet pump are the nozzle, throat and diffuser. These components are assembled in a variety of configurations and materials to suit the production requirements and down-hole environment. Power fluid at high pressure (low velocity) is converted to a low-pressure (high velocity) jet by the nozzle. The pressure at the entrance of the throat becomes lower as the power fluid rate is increased. Due to this lower pressure, fluid is drawn in from the well-bore. The suction fluid becomes entrained with the high velocity jet and the pumping action then begins. After mixing in the throat, the combined power fluid and suction fluid is slowed down by the diffuser. Because the velocity is reduced, the pressure increases – rising to a value sufficient to pump the fluid to the surface. A full range of nozzle and throat sizes are available to allow power fluid rate and pressure to be varied to meet various requirements. In a deep well pump system your nozzle and venturi are in the well, which requires a 2 pipe suction system to create the necessary PSI (pounds per square inch) to pump the water to the source. With the addition of the Tank along with the pump, you now have an single integral pump system ideally used for cabins and small water applications like trailers (such as construction job-site trailers – such as an ATCO trailer). If you have any questions about our Jet Pump Solutions, please call or contact us at (403) 243-3310 or Toll Free at 1.800.784-4324.